Photo: Don’t miss the market. Motoring south, the traffic congestion begins to thin out, the intense concrete jungle fades as pockets of green, then wedges of watery rice fields appear. A mere two-hour drive from Ho Chi Minh City and you’ll arrive at the Mekong River and My Tho, the provincial capital of Tien Giang Province and the gateway to the Mekong Delta. Its proximity to Ho Chi Minh City and its position on the northern bank of the Mekong is the key to My Tho’s importance. It should come as no surprise that in the late 19th century, French colonialists, in their quest to exploit and export, built the Saigon-My Tho railway line to connect the then capital to the river highway. It was the first railway line of French Indochina, part of a dream for a network across the Mekong Delta. Though the dream and line faded (stopping altogether in 1958), roads and bridges now move the goods and the city remains an important commercial hub for the region. Today, My Tho’s proximity to Ho Chi Minh City means huge potential for tourism as it can be done in a day. In fact, an organised day tour is how the vast majority of people find themselves here. If booking a “Mekong Delta one-day tour” from Ho Chi Minh City, it’s almost always My Tho, the bus zipping through the city to its pier where a boat shuttles visitors to a number of islands in the Mekong for a glimpse of typical Delta scenery and the region’s agricultural cottage industries. Unfortunately, the boat trips are controlled by the Tien Giang Tourist Office and for some reason, they think the best experience is to funnel everyone through a set itinerary on boats that seat ten or more people. A typical tour tends to encompass a bit of boating through a palm lined canal, followed by visits to a series of contrived attractions of diminishing interest, where you can see coconut candy or honey being produced, visit orchards and perhaps a small pagoda before finishing off with a meal break at any one of a number of riverside restaurants. An entire tour takes three to four hours, excluding transit time from Saigon. Hundreds are put through this hurried, impersonal experience every day. Counter to backpacker instincts, getting to My Tho independently and arranging locally isn’t cheaper, nor will it necessarily get you an up-close experience. You’ll be nudged to the official boat office who charge an artificially high amount for the private trip, same itinerary. The city’s budget accommodation is also limited. It’s hard to beat the travel agencies in Pham Ngu Lao offering the tour for less than 200,000 dong. 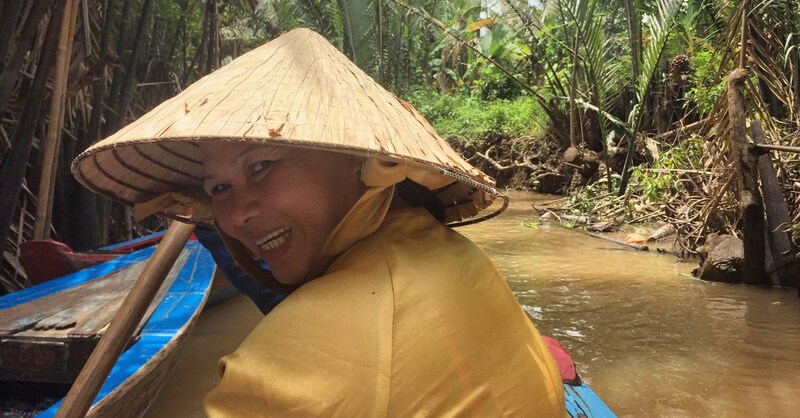 However, if you have plans to explore other parts of the Mekong Delta, then a cheap tour is not a bad way to start since it means a comfortable bus directly from the city centre (thereby avoiding the hassle of Ho Chi Minh City’s Mien Dong bus station). Simply skip the return. My Tho does have enough to satisfy a curious traveller staying a night. A late afternoon stroll along the river front is a must, and so is an early morning walk through the vibrant, wonderfully photogenic central market (Cho My Tho), bursting with everything the area grows. After the market, slurp up a bowl of the city’s famed hu tieu My Tho noodle soup, then visit the memorable Vinh Trang pagoda in time to catch the end of morning chanting and beginning of the monks’ meal around 10:30. You actually don’t have to reach the islands by boat. Unicorn (Con Thoi Son) and Phoenix Island (Con Phung) are accessible by the Rach Mieu bridge that connects My Tho to Ben Tre. If travelling by motorbike, you’ll still be able to see the general Delta scenery by road, and if you wish, visit the usual tourist stops (coconut candy factory, orchards, crocodile farm) or avoid them altogether. For Dragon island (Con Tan Long), a cheap local passenger/motorbike ferry departs from the pier on the Bao Dinh Canal, on Trung Trac St a block north of where it meets the Mekong. On the other side of the Mekong, Ben Tre is also excellent to ride around for scenery and is a more charming, less frequented base for riverine exploration. Unless the monopoly is removed or the tourism infrastructure improves, My Tho will pale in comparison to the other Mekong Delta towns, especially Can Tho, where travellers can get an up close experience which can only really be garnered in a small sampan. We’re not down on My Tho itself, just the way the experience is being packaged up. It’s true of any place: how much can you really see in a few hours? For now, My Tho is mostly a staging point for further explorations of the Mekong Delta. Travellers who don’t even have one night to spare and really want to see the famed palm fringed rivers, a day trip to My Tho is the ticket then. It’s certainly affordable, you’ll get beautiful photos and a belly full of addictive coconut desserts. My Tho sprawls out and lacks a cohesive city centre. The main area of interest to tourists is the river and the boat pier. Just west of the pier, evening street food carts and restaurants appear around the canal ponds at Ly Thuong Kiet and Yersin St. A few blocks east is the Bao Dinh Canal, which has the pier for the local ferry to the islands and the central market. Unlike Can Tho’s river road, which is bustling with activity, My Tho’s feels empty and under-utilised, yet is still worth the stroll. The main streets that radiate out from the river and pier, like Ly Thuong Kiet, Tran Hung Dao and Nam Ky Khoi Nghia, are more commercial and give you an idea of what the locals are interested in. Forget the Ho Chi Minh City conveniences like Grab or Uber. In My Tho, you may (or may not) find a taxi and xe om at the pier, river or pond-canal at Ly Thuong Kiet. Otherwise, your hotel can call a Mai Linh meter taxi who will go to your location at no extra charge. ATMs can be found every few blocks or so. The Tien Giang General Hospital is at 02 Hung Vuong St, a block behind the pier, though it’s best to get yourself to Ho Chi Minh City. “In Pharaoh’s Army: Memories of the Lost War”, Tobias Wolff’s acclaimed memoir of his time in the Vietnam War, the chapter “The Lesson” describes My Tho during the Tet Offensive. Please sign up as a Travelfish member to download the My Tho guide PDF (6.4 MB, 29 pages). Membership costs just A$35 per year (less than A$1 per week) and gives you access to over 250 PDF guides. Browse our independent reviews of places to stay in and around My Tho. Read up on where to eat on My Tho. Check out our listings of things to do in and around My Tho. Read up on how to get to My Tho, or book your transport online with Baolau. Planning on riding a scooter in My Tho? Please read this. Use the above map to find specific destinations in and around My Tho which are listed on Travelfish. Bed icons indicate a guesthouse, hostel or hotel, the knife and fork is an eatery or bar and the four-way circular thingy marks sights, attractions and other points of interest. Click on any icon for a short pop-up and a direct link to the page for that spot. If you are in the area, use the teardrop icon near the top left to show your position on the map (you'll need to allow position sharing for this last feature to work).